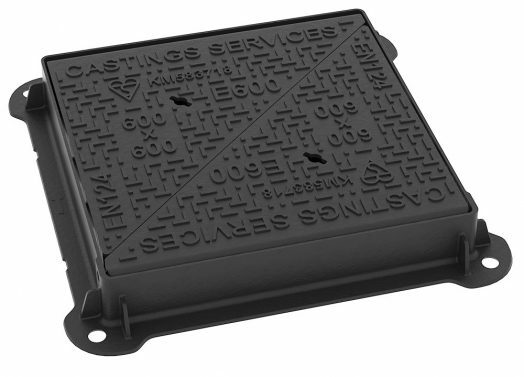 E600 Manhole Covers – Suitable for areas imposing high wheel loads such as docks and aircraft pavements or extremely heavily trafficked carriageways. E600 manhole covers are prevalent in docks, airports and heavy industrial areas where extremely heavy vehicles are operating. They are also common in inner city areas where the sheer volume of traffic, coupled with the expense and inconvenience of replacement, means they are often the ideal choice for such applications. The incorporated hinges also mean that these covers are suited for applications where regular access is required which is why they are very popular amongst telecom and utility clients. Ermatic covers are gas, air and water tight as standard. They are modular units which can be configured in numerous ways, the sizes given below or small example of the more common sizes we supply. If you have any large chambers or duct runs that need covering then please don’t hesitate to contact our sales team.